This Linear B Tablet is the first of the many Military Affairs tablets from Knossos which my teacher has given me to translate. It is relatively easy except for the fact it is truncated (broken) on the right hand side, this leaves us up in the air as to the exact total of swords that the scribe has listed. It is therefore difficult to state the exact total of these swords on my translation which is as follows. Translation : There is a total of 50-51, maybe 52 large double edged swords. Please read the rest of this translation on the link above. Further note:-. Would my fellow bloggers please leave a comment or even a like on my blog also on Richard’s blog. Many thanks. Thank you Aquileana, for your interest in my Linear B Translations. It’s a fascinating subject. 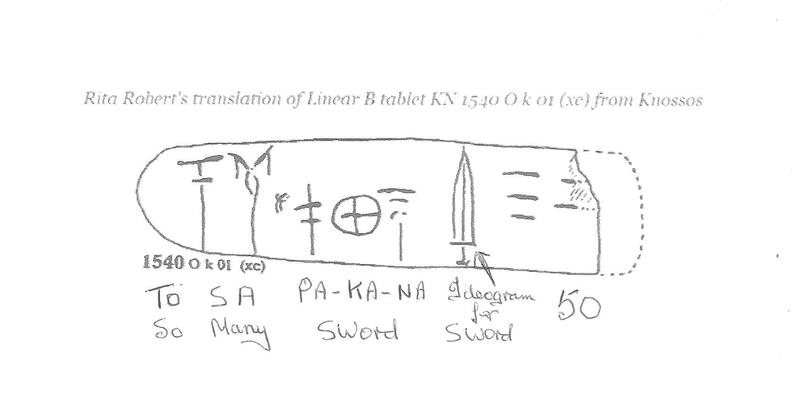 I am curious as to whether there has been progress into deciphering Linear A script. I’ve always enjoyed reading your translations and articles.